Ten years of majoritarian style AKP rule has turned Turkey into a polarized country, increasingly torn apart between contrasting worldviews and lifestyles. 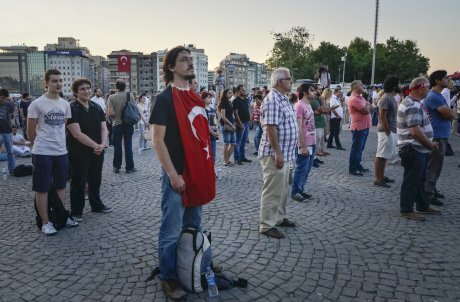 A man wears a Turkish flag during one of Istanbul's silent, standing protests. Demotix/Baris Karadeniz. All rights reserved. The most frequent question I have been asked since the start of the turmoil in Turkey has been whether it has surprised me. The answer is that very little of what has been done by the Justice and Development (AKP) government of the prime minister Recep Tayyip Erdogan has come to me as a total surprise. A quick look at some of what I have written or broadcast in recent years will explain why. By contrast, I have been watching the way the opposition has emerged and conducted itself with growing amazement each day. It has not been very difficult to predict how the government, particularly the prime minister, would react. On the other hand, not having foreseen the appearance of a spontaneous grassroots movement in Turkey before last month, it is now even more difficult to predict how it will evolve. Let’s start with the AKP government’s mostly predictable actions. Choosing obstinacy and confrontation over consensus, prime minister Erdoğan has adopted the language of a stern patriarch rather than an elected leader of a democratic country. He soon became the person with the last word on everything, from the number of children families should have to how a woman should deliver her child; from what kind of bread people should eat to what they should or should not drink; from what could be considered fine art to what should be demolished as an eyesore. He has even decided who would go to hell and who to heaven. In a country already seriously lacking checks and balances, Mr. Erdoğan and his ministers didn’t see anything wrong in telling the judiciary what to do. The prime minister complained that Turkey’s current separation of powers was a stumbling block for the country’s progress. Violations of due process in legal cases against political opponents became commonplace. When all else failed, tailormade legislation was rammed through the Parliament to smooth the way. Some reforms in recent years increased fears that it would give politicians greater power to appoint judges. Legal reforms definitely fell short on freedom of expression. Turkey’s foreign policy, shaped mainly by the prime minister, has been characterised by a series of miscalculations in recent years. Having been caught off-guard by the Arab Spring, Ankara has also failed to fully assess the possible consequences of its policy next door in Syria. Turkey was dragged into the conflict, with the resulting domestic and regional security threats, and exposure of shortcomings in Turkey’s intelligence and border security services. Not surprisingly, very little of this information found its way into the Turkish media. “They can call me harsh” he said, but this “Tayyip Erdogan won't change." Heavy-handed police action and the disproportionate and indiscriminate use of force against the protesters soon followed. Recep Tayyip Erdoğan, addressing a huge rally in Istanbul called by his party as a show of strength, placed the blame for protests on an international conspiracy. The prime minister and his ministers repeatedly point their fingers at the BBC, CNN, The Economist and the international media. A pro-government newspaper, Takvim, went one step further, faking an interview with CNN's Christiane Amanpour, quoting her as saying that CNN had covered the recent protests in Turkey on behalf of foreign business interests that wanted to hurt the country's economy. A few days after Gezi was stormed, T24, a reliable online news site, reported that the commander of the Special Forces praised his men, saying they wrote “the second Dardanelles Epic” against the protestors. Ankara’s AKP mayor Melih Gökçek gave orders for another message to be displayed publicly in praise of the special task force. A large banner with the words “Ankara is proud of its police,” signed by Melih Gökçek, the mayor, went up in the capital’s Güven Park, on a spot where an unarmed protestor was shot dead a few days earlier by a suspected police bullet. As if all this wasn’t enough, the state minister responsible for European relations, Egemen Bağış, published a statement in his official website telling just about everybody off. “Turkey has the most reformist and strongest government in Europe and the most charismatic and strongest leader in the world. Should anyone have a problem with this, then I am truly sorry. Only for those who feel overwhelmed, the leadership of Prime Minister Erdoğan is a problem,” he said. Which one is the real Turkey? "If anyone wants to see the real picture of Turkey," the prime minister Erdogan said, addressing a huge crowd of supporters in Istanbul, "this is Turkey." Of course, this was a large part of the reality of today’s more conservative, more religious Turkey. If the latest polls are to be believed, the prime minister still commands the respect and popular admiration of a large section of the Turkish population. There is also no doubt that he has been an effective and charismatic politician. He showed it last week by gathering large crowds at quite short notice, getting them to swear allegiance to himself and to his vision of a more Islamic, neo-Ottoman Turkey. He displayed his power over his ministers and officials. He rallied them, too, while he alone made decisions, gave crackdown orders and promised more to come. Once again, he has proved that he is the most skilful politician Turkey has produced in recent years. Yet, at the same time the other half of Turkey and the rest of the world, saw him for what he was: a powerful politician who is not much of a statesman. Turkey’s leaders may have lost their claim to be role models for up and coming democracies of the world but the country’s new-found voice in opposition is becoming the real inspiration. True, they are a diverse and disparate group but they display a strange solidarity, rarely seen in Turkey before. Dismissed as “hoodlums- chapulcular” by the prime minister, they embrace the insult and turn it into a bond that brings thousands onto the streets in sympathy. They are disciplined, orderly but fiercely individual. The contrast between them and the target of their protest could not have been greater. Those who braved relentless teargas and water cannon attacks by the police day after day; the crowds that shared their food, drink and anti-tear gas solutions generously; people who open the doors of their houses, shops and hotels to the injured; mothers making human chains to protect their children in public squares, all represent something new and profound. Unlike their frowning rulers, Turkey’s young rebels have a strong sense of humour. They have their music. Crowds gathered around a grand piano at Taksim Square long enough to sing, before the piano with its player were impounded by the police. Skimpily dressed women stood side by side with others wearing headscarves. Young men with long hair and tight jeans made way for others wanting to perform their prayers out on the square. Even their graffiti sets them apart. They scribble lines from Nietzsche, wanting to fight against bans and restrictions. Their anger is clearly directed at the prime minister and his increasing authoritarianism. They may not be overtly party-political but theirs is a strong grassroots movement. At the end of the day, a legitimate but incoherent movement may not be able to stand up to the might of an illiberal state. But if the lone standing man of Istanbul who instantly turned into a symbol and inspiration for thousands more to do the same is anything to go by, Turkey has at last discovered the power of peaceful civil disobedience.